Public art is getting bigger in Boston. Throughout Beantown, artists are taking to the streets, creating large-scale works that encourage citizens to embrace the city’s public spaces. If you download the brochure for the Public Art Walk from the Boston Art Commission website, you’ll see dozens of photographs of life-sized bronze sculptures. There’s the famed “Make Way for Ducklings” statue in the Public Garden, a statue of a grim Samuel Adams on Congress Street, a defiant Leif Erikson on Commonwealth Ave., and the Boston Women’s Memorial that has solidified the vacant stares of Abigail Adams, Lucy Stone, and Phillis Wheatley. These statues commemorate a rich history, certainly, but the works of art are cold to the touch and seem rather unapproachable. Contrast this with the swooping, vibrant strings that compose the gigantic sculptures of Janet S. Echelman ’87 (GSD ’08) and one wonders if the two conceptions of public art even occupy the same category of aesthetic experience. Broadly, public art is any artistic creation that interacts with the urban landscape and is available to the public, regardless of socioeconomic background. So how can we reconcile these two vastly different manifestations of public art in one city? Boston is simultaneously the home of the American Revolution and the birthplace of Facebook. It houses thousands of current or recent college students and is also the site of the first apple orchard in America.There’s an incredible amount of national history in these streets, but there’s also a growing population of young people looking for a place to settle down. This dynamic is reflected by the city’s evolving public arts scene—Boston is shedding its bronze historical statues in favor of more hip public art, bringing people together in the city in new and energetic ways. Shinique Smith's mural "'Seven Moon' Junction" recently opened in Dewey Square Park. And how does Brackenbury do that? By filling the city with exciting works of art available to the public. 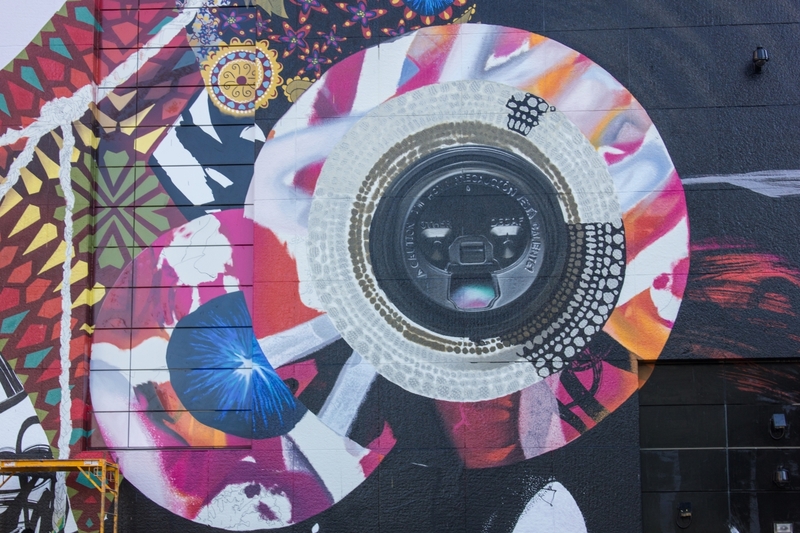 Brackenbury has tinted orange sunglasses, and he’s wearing a suit for the opening of Smith’s mural “‘Seven Moon’ Junction.” The mural is a flashy display with splashes of bright yellow paint, swooping swaths of black, and painted friendship bracelet braids drooping across the facade. An Ethiopian pop band is playing, children are running across the green space without shoes, classes of students are filing past a food truck. This is what Brackenbury envisioned for the Greenway Conservancy. It seems that city administrators support this view as well. Last week Mayor Marty Walsh appointed a chief of arts and culture, Julie Burros. According to a press release from the Mayor’s Office, Burros will oversee the members of the Boston Art Commission and the Boston Cultural Council, as well as their $1.3 million annual budget. The administration filled this “Arts Czar” position after it had been vacant for more than 20 years, and Walsh has stated that he wants to integrate art and culture into the lives of Boston residents. But what does that mean? How can we integrate “culture” into our everyday lives if it is an inherent part of our existence already? "Public art—particularly contemporary public art—can play a real role in making this a vibrant, 21st-century city," Jesse Brackenbury says. Boston has the potential to become another attractive, young city by creating artistic installations that bring people out of their buildings and into shared space. Think about the huge orange gates in New York City’s Central Park or the oddly attractive Cloud Gate, that huge metallic bean in Chicago’s Millenium Park. These works of art, even though the Central Park installation was temporary, became recognizable nationwide, and demonstrated the ability of public art to bring people into shared spaces. Though the Walsh administration’s push to increase art in the city started earlier this year, there are public art projects already years underway in parts of Boston. This suggests that the Walsh administration might be riding a public art wave rather than creating the ripple on its own. There is a rising tide of artwork on Boston’s shoreline: the HarborArts Shipyard Gallery has been attracting local artists to make sea-inspired creations for more than four years. If you’ve ever wandered down to the aquarium or taken a ferry to any of Boston’s islands, you may have seen the enormous orange cod that sits atop a warehouse in Boston’s old and still functional shipyard. This 40-foot fish is the center of HarborArts, Boston’s largest collection of contemporary outdoor public art and the only permanent gallery of outdoor art in the city. Steve Israel, creator of the sculpture, says he wanted to use his piece to engage the public in a conversation about water resources and the importance of preserving the marine ecosystem. Now, though, the space holds much more than the orange behemoth. “Our original mission was heavily focused on...educating people on water resource issues, but that has grown to a broader mission of really transforming an industrial space into a place to experience art,“ HarborArts executive director Matt Pollock says in a phone interview. One of HarborArts’s newest pieces is much closer to the ground than this lofty cod, but it also reminds visitors about Boston’s relationship with the sea. HarborArts is calling the piece the world’s largest tattoo: Somerville artist Liz LaManche created enormous inked designs that cover the cement dock, as if the shipyard itself were a sailor’s forearm. “Each tattoo represents a different culture that we’ve been connected to by sea in our sailing history of the past 200 years,” Pollock says of the artwork, which was completed two weeks ago. The Wampanoag, Mohegan, and Pequot—Native American tribes with roots in New England—are represented by a woven geometric pattern; another grid-like, dotted pattern is meant to represent West African BaKongo tattoo design, and Ireland is symbolized on the tattoo dock by a Celtic knot. LaManche has been working with artists who have knowledge of these culture and worked one-on-one with them to design the different tattoos. Because many of the works of art use found materials—bits of metal collected on the shipyard or other recycled pieces—or riff off industrial designs, it’s often hard to tell what is art and what is just part of the crazy industrial landscape of a working dockyard, Pollock says. This could be one unintended consequence of making art widely accessible to the public—a person could totally ignore the work, or perhaps acknowledge its presence but not have time to stop and ask questions. There is always the danger of an artist’s work being disregarded or interpreted as part of the functional environment of a city rather than an intentional, aesthetic creation. Public art doesn’t ask to be let in, but it has the potential of enhancing the way its audience interacts with not only the piece of art, but also the space that it occupies. Like the giant cod atop the shipyard warehouse, other big public artworks can enrich the context and history of the places in which they are displayed. This is true of public artworks on Harvard’s campus as well. How many historic buildings, plaques, and statues do we walk past just on the commute from dorm to lecture hall, and how many of those artifacts or memorials do we really understand? Maybe you had an Ec10 lecture in Sanders and ran through the vestibule in Memorial Hall, sprinting and slipping across the floor on your way from breakfast to class. You may or may not know that the building is an actual memorial—that the names on the walls are those of Harvard students who died fighting for the Union during the Civil War. You also may or may not know that there are no names of students who gave their lives fighting for the Confederacy. "When you're in [an indoor] gallery I think people automatically are searching for the meaning, but when you're in the public you have more freedom to engage with the artwork however it naturally comes to you," Matt Pollock says. Teil Silverstein, project director at the Office of Fine Arts Public Art Program, notes that Knep wanted to address themes of reconciliation and healing by depicting a blistering organic process on the floor of the historic building. “This really…made a lot of people aware of the fact that Memorial Hall…is about a war and a conflict and the people who were in that conflict and gave their lives for it,” Silverstein says in a phone interview. She goes on to describe past works of art that the OFA has commissioned; one that gained particular recognition was on display during the Arts First festival in 2012, David Michalek’s “Slow Dancing.” Projected onto the front of Widener Library, huge images of people dancing in slow motion made many passersby stop in their tracks and engage with the façade of an intimidating building that most students take for granted as a part of the academic landscape. Silverstein mentions that the artwork intended to draw attention to the library as a space of contemplation. “Public art is about a dialogue with the site, with the community,” Silverstein says. Large works of art like Michalek’s and Knep’s are meant to be educational, both for Harvard affiliates and for the wider community of people who might walk through the campus. Walking into Janet Echelman’s studio in Brookline feels a bit like walking into a laboratory; there are technical drawings tacked to the walls, complicated string sculptures strung from the ceiling, and a handful of workers typing into computer modeling software. There’s an incredible energy in the room as Echelman describes her past pieces, most of them large, whimsical structures that take up whole patches of sky. 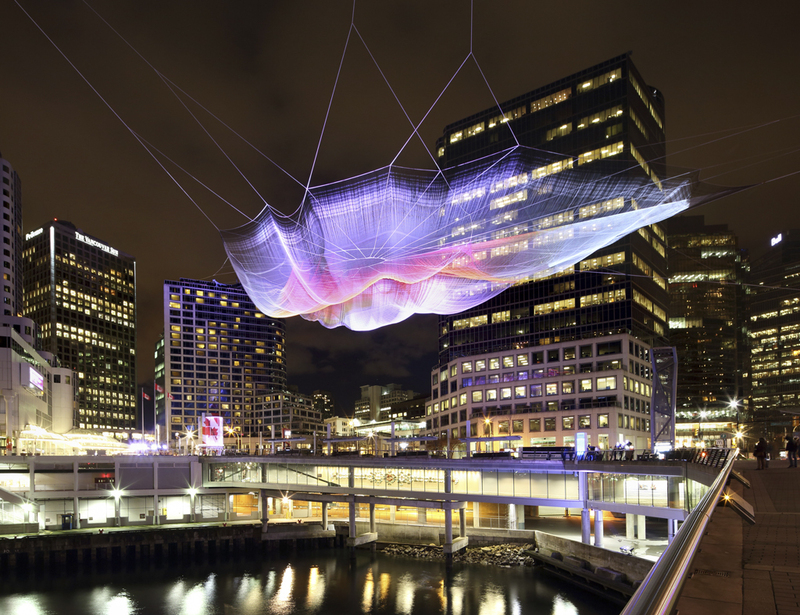 Janet Echelman installed her largest sculpture to date at the 2014 TED Conference. "Skies Painted with Unnumbered Sparks" spanned 745 feet across the waterfront in in Vancouver, suspended from skyscrapers. There is one sculpture that was modeled after graphic data collected from the 2010 Chilean earthquake and resulting tsunami that shortened the day by 1.26 microseconds. That length of time became the title of this piece, and its colorful, billowing form has been displayed in Amsterdam, Sydney, and Singapore. The collapsable, relatively light structure of the sculpture makes it very mobile; it can be literally woven into a city—tethered to the earth by ties to buildings alone. Echelman speaks enthusiastically about this piece’s versatility and mentions her plans to create a new sculpture for Boston that is equally integrated with the cityscape. “I am intrigued to enter into a conversation about the decisions that have shaped this city at different times,” Echelman says about Boston. The sculpture is similar in shape to the highway that once passed directly through the heart of Boston—Interstate 93, also called the Central Artery. Echelman will string the sculpture over the Greenway, which is also the former location of Interstate 93 before the “Big Dig” buried that highway underneath the city. “My goal is to embrace and recall the history of this place as an example of what we have done in cities since the Second World War, where we gave the automobile higher priority than the dwellers of the city,” Echelman says. "My art begins with a ghost image of the old elevated highway and transforms into stitching this city back together again. It’s calling attention to the transformation that’s ongoing." These large works of public art—whether on the side of a building in the Rose Kennedy Greenway, atop a warehouse in the shipyard, or inside Memorial Hall—allow viewers to understand not just the piece of art itself but also its environment in a new way. Echelman’s sculpture is set to open in May 2015 and will be installed above the Greenway until October. Not only will the buildings around Dewey Square be connected by colorful, sturdy string, but Echelman also points out that the installation of the piece will require collaboration between building managers and city planners. In a sense, the sculpture has already encouraged interaction between Bostonians. That is just what Brackenbury hopes will occur in the Greenway—more people interacting in the public space, enjoying the park, creating an exciting city atmosphere and discussing art with their necks craned skyward. —Staff writer Virginia R. Marshall can be reached virginia.marshall@thecrimson.com.